So this isn’t exactly a myth, but Homer is alluded to in Persephone,so to me it makes sense to include him in a Mythology Monday. 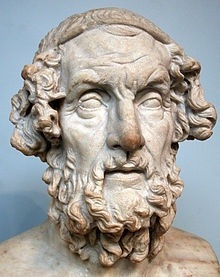 Homer is the alleged author of both The Iliad and The Odyssey. I say alleged because there is some dispute over the matter. There’s this whole Homeric question over when he lived and what he might have written, but for simplicities sake, let’s assume he wrote both. Homer was possibly blind, and may have lived in a few different time periods or not at all, but again, let’s keep it simple. The Iliad tells the story of the Trojan War. It starts ten years into the war, and mostly follows Achilles, a demigod by the goddess Thetis, who is angry because his…. erm, war prize girlfriend, Briseis, was taken from him. He refuses to fight, so Patroclus his cousin/friend wears his armor and is killed. Then Achilles gets really mad, and starts fighting again. He kills the Trojan prince Hector, and disrespects his body. There’s a massive battle, then everyone takes some time off to bury the dead. A ton of other stuff happens in the story, Hector seems really nice and there’s this really cute scene with his infant son, so it’s really sad that he dies, but it’s an epic. A paragraph summary is bound to leave something out. Odysseus (called Ulysses by the Romans) is also in this book on the Greek side with Achilles. The Odyssey starts ten years AFTER the Trojan war and follows Odysseus’s ten year journey home. (Home likes the number 10). Penelope, Odysseus’ wife is being pestered by suiters, but she hasn’t given up hope that Odysseus is alive. Given that she hasn’t seen her husband in over twenty years, that’s a lot of faith. She also has a son, Telemachus, by Odysseus whom he has never met. Sadness. Odysseus journeys home through all kinds of adventures, and then kills all of his wife’s suitors. They all live happily ever after (if you ignore that poem by Alfred Lord Tennyson). Homer wrote a few other books and poems about the Trojan war, but these are the important two. They are important because every writer for hundreds of years tried to make their own version of these epics. Virgil wrote the Aeneid based on these books, Dante was influenced by them, Alexander Pope, and more recently James Joyce. There are still books and movies and all kinds of media dedicated to the stories from Homer’s epics. Including mine. Granted, Persephone is only briefly mentioned in The Iliad, and is not mentioned in a terribly complimentary way when Odysseus travels to the Underworld (she’s referred to as Proud Persephone and sends the souls of women to torment Odysseus as he journeys through the Underworld) but she’s there. So is Hades, Helen of Troy, Cassandra, and many many more characters of my world.